Historic among all golf destinations, Hilton Head Island was the nation's first master-planned resort community. In 1956, Charles Fraser envisioned a new kind of residential development, where homeowners would happily co-exist with nature. Fraser, who owned 19,000 of the island's 25,000 acres, created previously unheard of covenants -- many of which remain in place today -- such as prohibitions on high rises, on homes built between the dunes and the ocean, on white houses (which would look out of place in the natural setting), on neon signs, streetlights and other light pollution ruining the night sky. Hilton Head, which is 12 miles long and five miles wide, is divided 11 master-planned communities, known as "plantations." One of them is Palmetto Dunes Oceanfront Resort, which opened in 1978 and remains an extremely popular first, second and retirement home golf community. And, after 35 years, it is still run by its creator, Greenwood Communities & Resorts. That stability is very rare in the development world. Palmetto Dunes spans 2,000 acres and three miles of Atlantic Ocean beach -- and it is home to three championship golf courses. 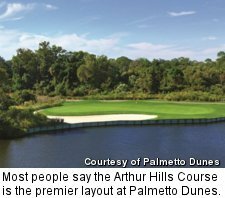 Most people say Palmetto Dunes' Arthur Hills Course, built on a series of rolling hills, is the premier layout. But the Robert Trent Jones Course, a Certified Audubon Cooperative Sanctuary, is one of the few golf courses on Hilton Head Island that offers unobstructed ocean views. The George Fazio Course, meanwhile, is the island's only par-70 layout. 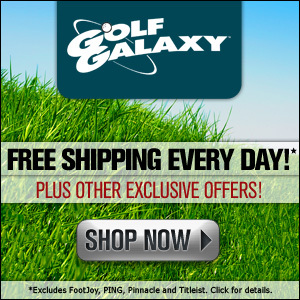 Golf is an obvious highlight at Palmetto Dunes, but it certainly isn't the only one. Tennis is another huge draw on Hilton Head, and Palmetto Dunes doesn't disappoint. The Palmetto Dunes Tennis Center, which was ranked among the top 50 U.S. tennis resorts (and first in the Carolinas) by Tennis Magazine in 2012, features 23 clay courts and two Nova ProBounce courts. Six of them are lighted for night play. The tennis center offers a full schedule of seasonal tournaments, daily round-robin tournaments and instructional programs for players of all ages and skill levels. The resort also has a huge beach, with chairs, loungers and umbrellas, and on site Hilton Head Outfitters rents canoes, kayaks and boogie boards, although many homeowners have their own. Anglers can choose fly rods or light tackle and go after everything from trout to large redfish, bluefish and flounder. The community's Shelter Cove Harbour sits just off the Intracoastal Waterway and is the island's largest deep-water yacht basin, with 170 slips accommodating ships up to 120 feet. 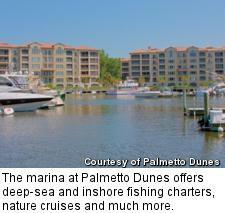 The marina offers deep-sea and inshore fishing charters, sport crabbing, boat rentals, nature cruises and more. It is also a popular waterfront spot for dining, shopping and entertainment, with more than 20 shops, boutiques, galleries, restaurants and cafes. There are several other restaurants, bars and stores throughout the Palmetto Dunes community. Outside Palmetto Dunes, Hilton Head Island features many miles of paved bike paths, a very popular way to get around and exercise, and has two dozen golf courses, nature preserves and continuous beach spanning all 12 miles of the East Coast. There are more than 250 restaurants and a full range so shops and services. 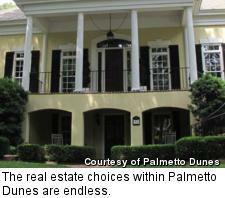 Real estate choices within Palmetto Dunes are endless. There are nearly 1,300 homes and home sites, including 74 currently on the market from $429,000 to $5 million, with a huge premium on being close to the ocean. There are more than 2,200 "villas" (what Hilton Head calls condos), with 148 on the market from $165,000 to $2.8 million, but the majority are less than seven figures. Entry level is a unit less than 800 square feet, while the top-end condos run up to 3,746 square feet. There are also 22 quarter-share fractional units for sale within the Shelter Cove subdivision, from one to three bedrooms, starting at $53,000.